Egg bowls have quickly become a staple in my “what can I whip up that’s easy and healthy” arsenal. I approach them as you would a poke bowl—you start with a good base, (in this case, polenta) and layer in a variety of flavors to your liking. Polenta is simply corn meal that is pretty much flavorless, but serves as a great foundation to any meal—the best part about it? It’s gluten free! This healthy, but hearty dish can be constructed based on the flavors you fancy. Craving a little Tex-Mex? Throw in some black beans and salsa. More on the Mediterranean train? Roast some cherry tomatoes and add a dollop of pesto. That’s the beauty of these bowls, you can’t go wrong with any theme you choose, but be sure to pick a genre and stick to it. We’re not endorsing a black beans and pesto combo, although crazier things have happened. Be forewarned, polenta congeals the longer you hang onto it. So, if you find yourself with a Tupperware of sticky polenta after a day or two, consider forming round balls or squares and grill them for a different consistency. You can top them with a piece of chicken or fish and a veggie for an easy, gluten-free week night meal. Slice the polenta into 1 inch round coins. Coat your pan on a stovetop range with olive oil. Toss the polenta into the pan until grilled on either side (feel free to mash them around or keep their integrity, it doesn’t much matter either way!). Dice the Canadian bacon into small cubes. Throw them into the same pan you used for the polenta until lightly charred, set aside. Cut your avocado into slices. Pan fry two eggs until desired consistency is achieved (we like ours a little runny for this dish). Compile a bowl starting with the polenta as the foundation. 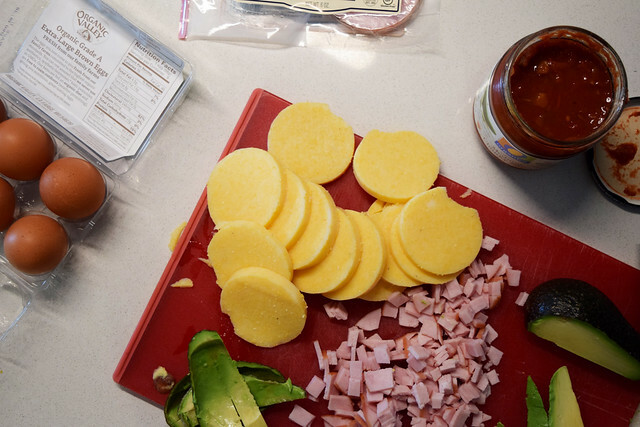 Arrange the various toppings, in this case the avocado and Canadian bacon, on top of the polenta. Top with a fried egg and a dollop of salsa. Add salt and pepper to taste. Mix up all that goodness up and enjoy!